“The first rule of Dog Club is: You do not talk about Dog Club”. I’m going to break the first rule and tell you about Dog Communication. We first met with Penel and Laura who run Dog Communication about a year ago, and have kept going back ever since. It’s brilliant! Theo gets to play off lead with a mix of other dogs in a controlled environment. For us, it’s perfect as Theo is mostly on-lead these days due to his escape-artistry and high prey drive. It means he gets to play freely and interact on his own terms. 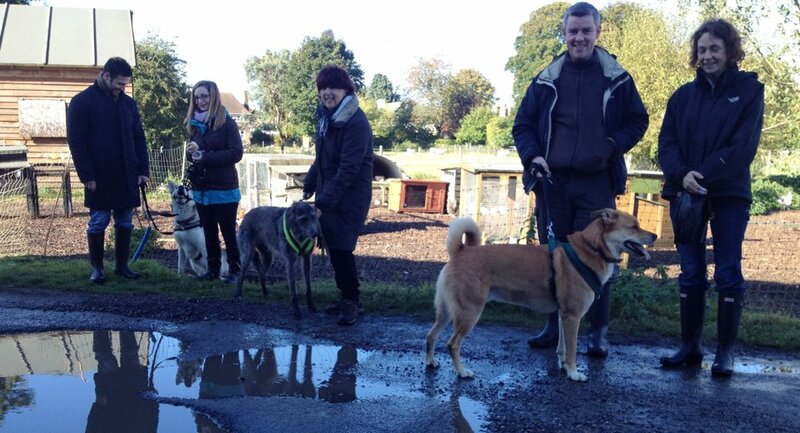 Dog Communication use kind, effective methods and focus on using dogs to teach other dogs appropriate behaviour. We are based in Banstead, Surrey, and specialise in dogs that have dog aggression issues. Based in a farm with fantastic views over central London (on a clear day), Dog Communication provides a safe, controlled environment. The dogs are all in muzzles, and the trainers (Laura and Penel) carefully choose which dogs are in the field (large and fenced off). Over time, I’ve come to appreciate the true value of this. To watch a new dog, often nervous or perhaps overly-boisterous meet the teaching dogs and the rest of the dogs is fascinating. The size of the field allows a more natural interaction that we simply don’t get on our usual walks. There are so many signals given by the dogs, and each interaction is unique and entirely dependent on the situation. Often nervous dogs may look aggressive, or anxious dogs may lick themselves excessively. When we first attended, Theo was often barked at as his behaviour was judged to be a bit rude. He would often run straight upto the other dogs he was interested in and be a little pushy. Since then, we’ve benefited in a number of ways from Theo simply being more comfortable meeting new dogs, and also our own skills in noticing his behaviour and developing our bond with him. We’ve come a long way with the boy as he’s grown, and he is a happy balanced dog. Watching him in the last few weeks, he now shows much more patience with other dogs, and if a fight amongst the others starts he has occasionally intervened by body blocking and standing between the protagonists to calm them down. In the youtube clip you can see Theo playing with Kaya (a female husky) that he has a soft spot for. You can also get to see his bushy, curly tail that can knock coffee cups from low tables. This is where the husky part of the lab-husky breed we talked about can clearly be seen! P.s. He’s not keen on wearing a muzzle (our secret is peanut butter on the inside).